Just a couple short years ago, Katie Fitzsimmons (Katie Wetzstein back then) was tearing up the track and cross country field for the University of South Dakota. Before leaving USD, she would set a couple of school records, run extremely fast, and earn national recognition. In the 5-mile Shamrock Shuffle, Katie placed 13th out of 11,648 women with a time of 27:57. Katie was the second female finisher in the Lincoln Half Marathon with a time of 1:17:20. At Midnight Madness in Des Moines, Katie was the third female finisher in the 10K with a smoking time of 36:18. Katie set a new Lincoln Running Company Racing record at the Lincoln Mile this year, running 4:52. Katie also placed 36th in the Woody Greeno Cross Country meet earlier this year—that’s 36th in a race full of speedy college kids! In the 5-mile Buffalo Run, Katie was 10th overall and the first female finisher with a time of 29:50. At the Good Life Halfsy, Katie once again took a place on the awards stands as the second overall female in a time of 1:17:54. 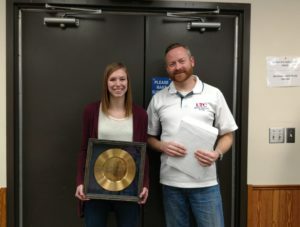 Katie is a wonderful competitor, contending on an elite level, and the Lincoln Track Club is honored to present her with the 2018 Distinguished Achievement Award.